If the thought of installing your Stromberg GFRC fills you with dread, not to worry. Stromberg Architectural offers turnkey services that include GFRC installation. You can order from the stock models or order a custom product. 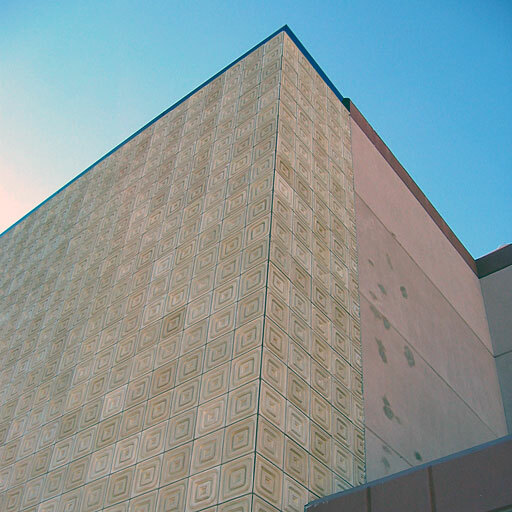 For example, the Anthropologie store in Scottsdale, AZ, ordered nearly 2,000 blocks to make a rain screen when they renovated the store in 2005. These blocks were a custom design that reflected the cultural wares Anthropologie is famous for. Stromberg Architectural molded the pieces, delivered them, and installed them. The rain screen allows for an enormous number of stock or custom motifs. By using different motifs, textures, and colors, one can accomplish designs ranging from primitive to space age and all the eras in between. These motifs can be arranged so the blocks form a meta-motif from the design on the rain screen as well. The blocks can be custom colored and textured in addition to the motif choices. Although Stromberg Architectural installed the nearly 2,000 blocks for Anthropologie, the installation is very simple and straight forward. Tedious, perhaps, with that many blocks to align in perfectly straight lines, but we are experts at getting things exactly right for our customers. If you are interested in GFRC products, please give us a call us at (903) 454-0904 today or email us at info@strombergarchitectural.com. We will work with you from conception to installation.